We have to admit, when we first heard about bikeshare, we were a bit skeptical. The real cause of low ridership, we thought, wasn’t a lack of bikes, but a lack of safe places to ride. Bikeshare has since rolled out in many cities and we’ve had a chance to ride multiple systems over the last year. We first tried them out of curiosity during a business trip, to see what the big deal was. When we threw a leg over, we weren’t that impressed. The bikes were heavy, awkward, and had the grace of pushing around a loaded shopping cart. But after a few minutes, we got used to the lumbering beast of a bike, and actually started to have fun, despite ourselves. 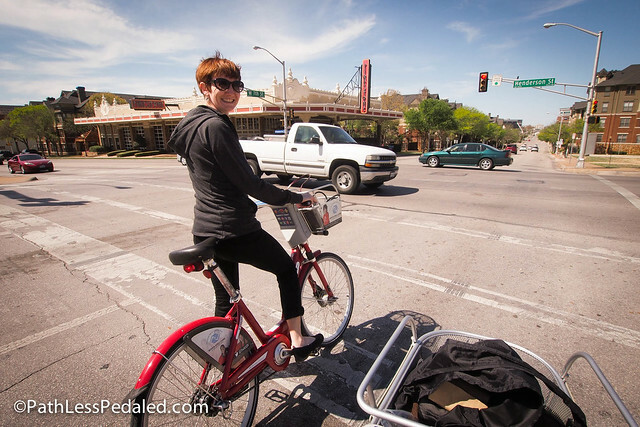 When we were in Austin, TX (which has a fairly robust system), we were surprised at the range of people using the bikes. They weren’t “bikey” people, but casual riders running errands or curious tourists giving them a try. 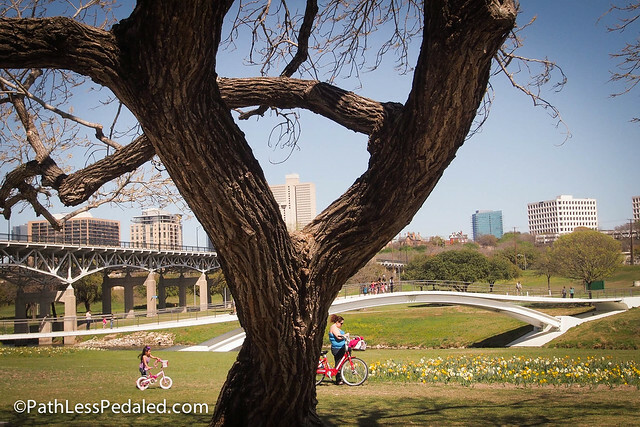 In Fort Worth, TX, we saw parents on bikeshare bikes riding the Trinity Trails with their kids, and tourists riding them to the different pop-up restaurants along the river trail. That was our “ah ha” moment, because it was a completely different use than we had expected. 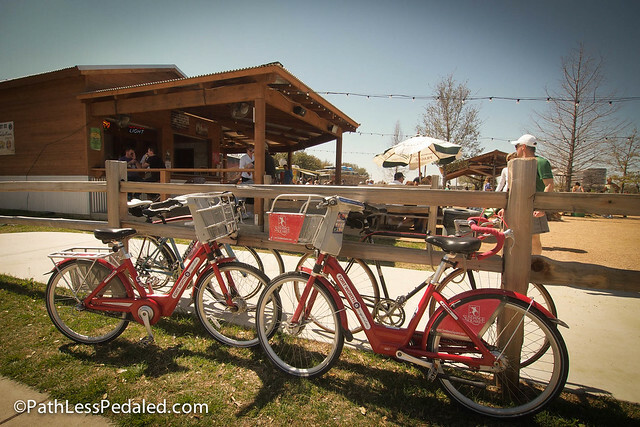 The bikes weren’t used as a strictly utilitarian transportation device, but as a tourism asset for visitors to more efficiently explore and enjoy waterfronts, restaurants, and retail districts. We were sold. 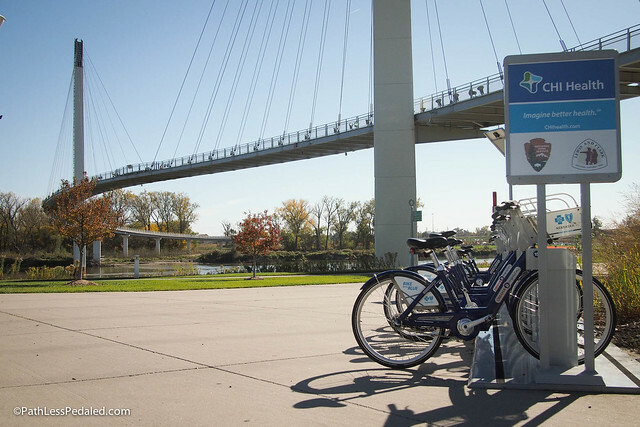 During our current trip through the Midwest, we’ve used bikeshare systems in both Omaha, Nebraska and Des Moines, Iowa. We are on a pretty grueling schedule of speaking, presentations, and conferences, without too many chances to get some exercise. As an alternative to spinning away in the stuffy and sweaty fitness rooms of various hotels, we’ve taken out bikeshare bikes at every opportunity. In this context, the heaviness of the bike just adds to the workout. 🙂 Not only do we get to stretch the legs but we get to do some sightseeing as well. Speaking with a person from the chamber in Des Moines, she said that they were also finding visitors among the highest users of bikeshare. This makes a lot of sense. 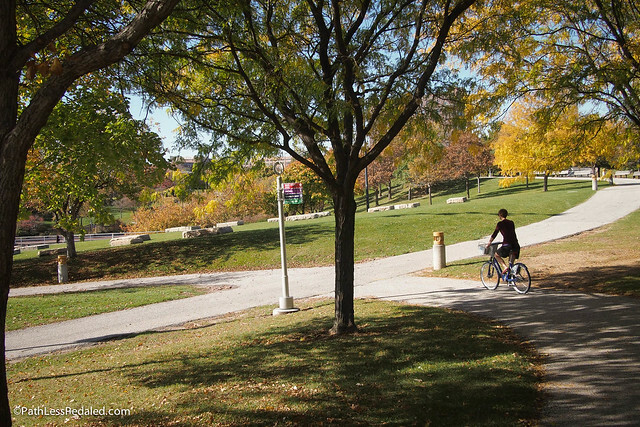 Bikeshare bikes are relatively inexpensive compared to a bike rental, and they are often placed near popular civic spaces (parks, waterfronts, bike trails, business districts). 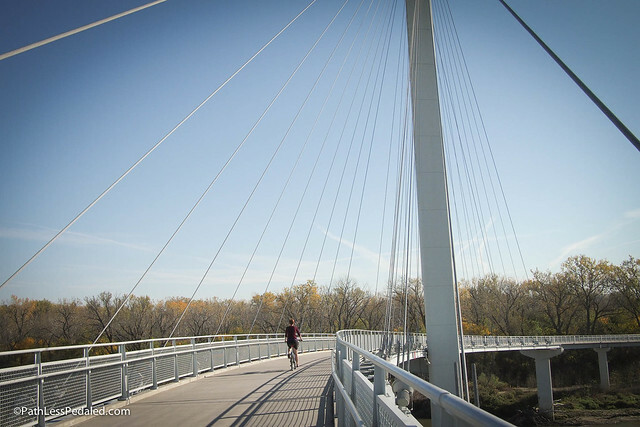 This combination of affordability and accessibility, in desirable locations, make them a great mode for pedaling tourists. As “business travelers” during the last few weeks, they have been a blessed alternative to hotel fitness rooms. While we were skeptical at first, we’ve turned the corner and have become fans. When/if Portland does get its own bikeshare system, we probably won’t use them, since we already have a stable of bikes at our disposal. But when we travel without bikes to other cities, we’ll probably ditch the cab whenever we can and throw a leg over these odd lumbering beasts. I initially thought they would only work for tourists. I’ve bought rideable bikes for about the cost of the annual membership for shared bikes, so I never thought it would catch on with locals. But when I’ve traveled for conferences to Montreal, Boulder, and Toronto it’s been great to have access to a bike. I’ve also just asked around and been lent a Dura-Ace level race bike gratis too, so a little sweat talking helps too. I haven’t used it yet, but I think Spinlister has good potential, if only more people would list their bikes. But be warned. There is a $100 deposit on the DC bikeshare bikes that there is no sign warning you about. When I complained, the bikeshare said it was just a test purchase for the credit card, so wasn’t really charged. I, however, used my sharecheck card, so It took 10 days to get my money returned! We were just in Alexandria near DC and using the bike share was a fantastic experience. We had a station around the corner from our airbnb with the nearest metro station about a mile away. We were able to ride into DC, hop on and off the metro, ride back or take the metro then use the bikes to get back to the airbnb. $15 for a 3-day pass was a bargain. The combo of walking/bike share/metro could not be beat for getting around. For a day-long ride, we rented bikes from a shop but for the on-and-off rides while seeing the sights, the bikes were great. You could dock and then undock at at station to keep your time within the free 30-minute limit. And they’re not as clunky to ride as they look. Bike share bikes in most major urban markets are not the best solution for recreational tourism. Counter to what is stated in this article, bike share bikes are not less expensive than traditional rental bikes. Alternatively, once you ride past a certain threshold, typically around the 1 hour range, bike share bikes become significantly more expensive. A traditional rental typically cost around $10-$15 per hour and $20-$40 per day depending on the market. While bike share is in fact cheaper for the first hour, often advertised as free for a half hour, then an incremental increase, once past that first hour, the incremental pricing increases dramatically. In some markets a full day (6-8 hours) can exceed $100 in charges. Granted some or most bike share systems will allow customers to dock the bike and wait for a certain time period (15min – 30 min) and then restart the clock at the lower price range. However, for the tourist to coordinate this along with finding docking stations that have room to dock bikes or bikes available to continue touring is a tedious way to spend a day on holiday. 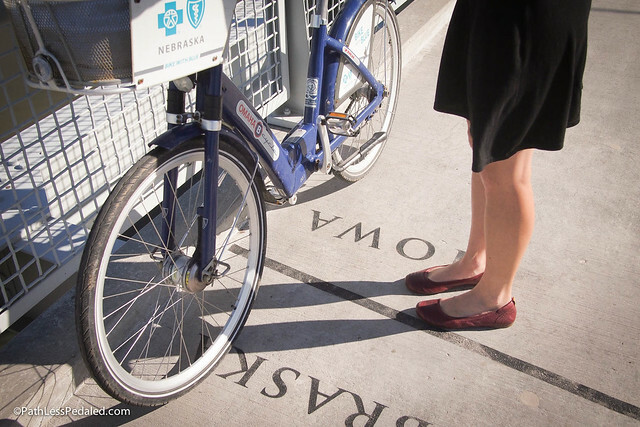 Bike share is designed for short trips and municipalities have granted special access to bike share such as sidewalk space and street advertising in order to allow bike share to take hold. The goal is to address auto traffic congestion and pollution, not to move people from an existing bicycle solution (private bike rental companies) to the subsidized or sponsored public system (bike share). The intended target audience is people using cars for short trips who could be converted with the offering of a convenient bicycle solution. In many markets tourist do in fact make up a large percentage of the bike share users. For short trips this is terrific, but for longer trips this results in both a reduced customer experience and a strain on inventory. The customer experience is reduced because bike share pricing is often misleading due to how it is structured and presented. Most tourists using the bicycle to explore a destination will utilize the bike more than two hours and this often leads to both surprise, disappointment and often anger over the final bill. Additionally, if bikes are being utilized for longer trips, docks are left empty and those who might be persuaded to shift from auto use may find the system frustrating to use because the bikes don’t rotate into the docks as frequently as needed. As an operator of both a bike share system and traditional rental companies it is my hope that other bike share enterprises resist the temptation of the low hanging fruit that is tourism and that they make a concerted effort through marketing and other venues to grow their business serving short term users. This is the best use of resources and promotes the best experience for the end user – which in turn will help grow bicycle use in general.